Octobia May is girl filled with questions. Her heart condition makes her special - and, some folks would argue, gives this ten-year-old powers that make her a "wise soul." Thank goodness for Auntie, who convinces Octobia's parents to let her live in her boarding house that is filled with old folks. That's when trouble, and excitement, and wonder begin. Auntie is non-traditional. She's unmarried and has plans to purchase other boarding homes and hotels. At a time when children, and especially girls, are "seen, not heard," Auntie allows Octobia May the freedom and expression of an adult. When Octobia starts to question the folks in her world, an adventure and a mystery unfold that beg some troubling questions: Who is black and who is "passing" for white? What happens when a vibrant African American community must face its own racism? And, perhaps most important: Do vampires really exist? In her most and probing novel yet, Sharon G. Flake takes us on a heart-pumping journey. 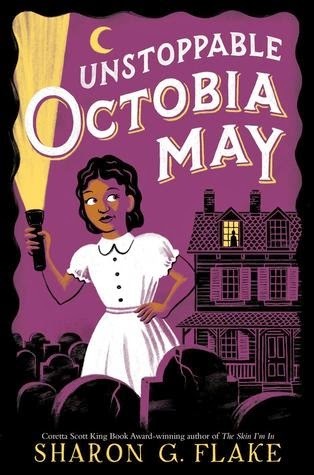 Unstoppable Octobia May is the first book I read on the Kindle app on my phone. What took me so long? I read this book in a flash because I was always able to sneak in a page or two, no matter where I was. I'm a big fan of Sharon G. Flake; all of my students, no matter where I live, have read The Skin I'm In. Now that I'm back in The Bahamas, I like being able to add to the collection of titles with main characters that are African American. Even better, this is a mystery that will have readers puzzling until the very end. Still, I didn't adore this book the way I enjoyed others by Flake. At times, I found it confusing to follow the plot, or even who was speaking. It's very rare that I have this problem, so I think it would be a big issue for younger readers. While Octobia May and her best friend Jonah were very developed, there were far too many other adult characters to keep track of, often with only one or two distinguishing characteristics and no physical descriptions. Despite being geared towards middle grade readers, it may be challenging for them to read. For me, the best part of the book was the friendship between Octobia and Jonah. It reminded me of the relationship between Scout and Dill in To Kill a Mockingbird: the mischief, loyalty, and closeness that comes from growing up together and being through so many adventures. I often ask my students what is the residue of a story, what sticks with them. For me, it will be the image of Octobia forcing Jonah to perm her hair and then being angry with the results. This affected me more than any of the mystery that followed. 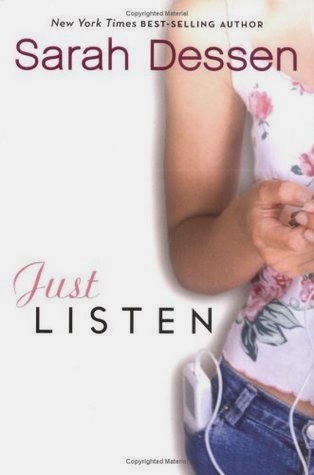 But when I was reading Dessen's Five Facts on Twitter about the books, I realized that I had never read Just Listen. What a treat! From the outside, Annabel looks like she has the perfect life: she is a model, literally lives in a glass house with her beautiful sisters, and was one of the most popular girls in school. In reality, she hates modeling, her family has its share of problems, and she has been shunned because of some gossip started by a former friend. Exiled to eating lunch alone, Annabel meets Owen, another loner who is committed to honesty and "enlightened" music, and learns that telling the truth is the most important thing you can do. I loved this book, and can't tell if it is because it was a surprise gift of unread Dessen, or if it was the story. Owen is an amazing character and I hope that he inspires teenage readers to give a chance to students that they might dismiss as weird or losers. I also think his honesty policy will help all readers to consider their words before they speak, or at least not fall back on the default "I'm fine" when they really aren't. This would be a perfect "light" accompaniment to Laurie Halse Anderson's classic, Speak. Hooray for reading surprises! Sarah Dessen forever! I've been trying to track down Beneath a Meth Moon for awhile; hooray for inter-library loans! I just finished reading an adult zombie novel (Patient Zero), but I really think that a story about a teenager using meth is far scarier than anything related to zombies. Laurel moved to a new town after the deaths of her mother and grandmother during Hurricane Katrina. When her new boyfriend, T-Boom (girls, never date a guy named T-Boom) introduces her to "moon", she quickly becomes addicted and her life disintegrates. Much of the story is told in a series of flashbacks Laurel has as she sits on a street corner, begging for change. The moon has replaced everything she loved and left her with nothing. It's hard to find cautionary drug stories that are appropriate for middle school students. So many are graphic, like Ellen Hopkins' novels. Author Jacqueline Woodson strikes the right balance here. She references the physical deterioration of Laurel, with a mother asking, "How could you not have seen your daughter wasting away in front of you? Your daughter's darting eyes, her broken-out face, the tiny burns on her lips and fingers?" But Woodson never gets into the very grim realities of life as a meth head. It is scary enough to be a conversation starter, but still age appropriate. I haven't always enjoyed Woodson's books in the past. 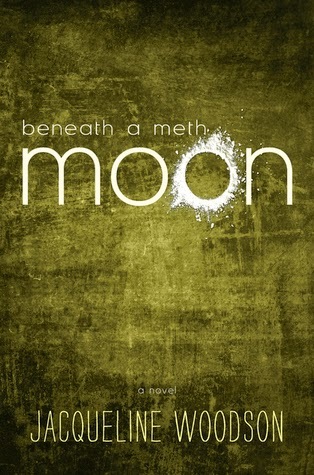 Beneath a Meth Moon is an important book to make available to adolescents; just make sure you are available for discussion after they finish. Marisa de Los Santos is one of my favorite adult writers; I've read all of her books multiple times. 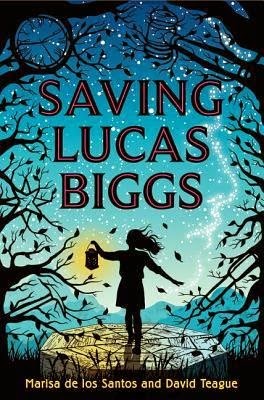 A poet, de Los Santos always manages to select the perfect words, so I was eager to see how that would translate to her first middle grade novel, Saving Lucas Biggs. This book, written with her husband David Teague, was a satisfying page turner. It was a bold choice to go from adult contemporary fiction to a middle grade time travel novel. Margaret's family has the "quirk" that they are able to go back in time, but they have all sworn never to do so. But when her father is sentenced to death for a murder he didn't commit, she must use this quirk to change the past to save his life. Going back to the 1938 mining community where her best friend's Grandpa Joshua grew up, she must convince 13 year old Josh to help her before she runs out of time. It was fun to see how de Los Santos transitioned her writing to a lower level. Her trademarks shine through: she always uses the word "reconnoiter", in this case, she defines it for the reader. The language is stripped down a bit, but still gorgeous and poignant: "Charlie and I hadn't spent one second of our lives without parents who loved us. We lived inside that love the way we loved inside our own bodies, without thinking about it, and definitely without thinking what it would be like to live without it." And it wouldn't be de Los Santos without some impressive food descriptions, like caramelized banana pancakes with maple syrup and peach pancakes with creme fraiche. Saving Lucas Biggs solidified my belief that I will love anything she writes. Parents often ask me for "innocent" books to recommend to their children, and this novel is a perfect example. It has lots of good lessons about peace, friendship, and doing the right thing, without being preachy. I can't wait to see what's next for Marisa de Los Santos. 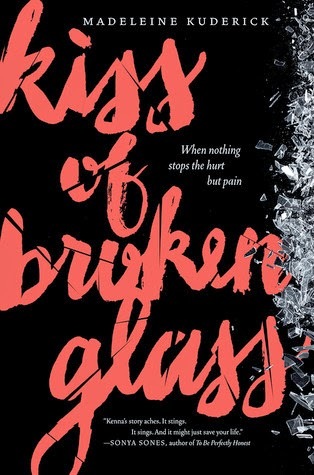 Can we take a moment to bow down to Abigail Haas, the queen of YA psychological thrillers? I don't know why she isn't a huge name in YA lit circles; she deserves praise for her ability to craft novels that explore the dark side of teenage girls' lives. In the summer before college, Chloe was ready to escape her small town for adventures and a life beyond the whispers of her neighbors. Her mother's breakdown shatters that dream and she is left behind with nothing, except bills to pay and stress. In her words, "I'd always done the right thing, but there I was on a Friday night, pouring soda refills, while people who worked half as hard, sacrificed half as much, were living it up in a world I could only imagine." This state of desperate loneliness leaves her open to a relationship with Ethan, a sweet guy who sees Chloe as better than she sees herself. When Ethan's charismatic brother Oliver arrives, he begins a dangerous game that ends in death. 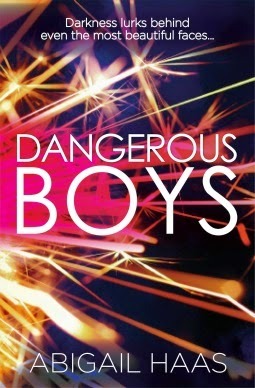 Dangerous Boys is incredible, a book that begs to be read in one greedy sitting and pondered afterwards, similar to Haas' Dangerous Girls (similar title but not related). None of the characters are likable, but all are engrossing, frustrating, and dark. I found myself irritated by Chloe's attraction to Oliver, who is so obviously bad news that he warns her, saying, "Deer may be stupid animals, but they are at least smart enough to run away when danger comes their way." If Chloe's family hadn't fallen apart, she never would have been drawn to the sinister Oliver and all that he brings out in her. If you've read Haas' work, you adore it. If you haven't, you are missing out on a fascinating and twisted novel. Move Dangerous Boys to the top of your To Be Read pile. I can finally talk about Blood of My Blood, the conclusion to the Jasper Dent trilogy, which I received early from NetGalley. I found both I Hunt Killers and Game to be gripping and gruesome thrillers. Barry Lyga found a way to top them in the finale, with many plot twists and satisfying character endings. The first two novels involve Jazz dealing with followers of his serial killer father, Billy Dent. Blood of My Blood has Jazz going after his own family, who are far smarter and more devious than anyone could imagine, except Jazz. Billy's voice, which has haunted Jazz for his entire life, is now guiding him towards what he needs to do to make the world safe again. I want it to be really clear that this is not a middle school novel. The descriptions are graphic and the the topics are inappropriate for young readers. Mature high schoolers and up will be racing through the novel, eager to find out what will happen. As the conclusion to the series, no character is safe, which makes it an even more exciting read. 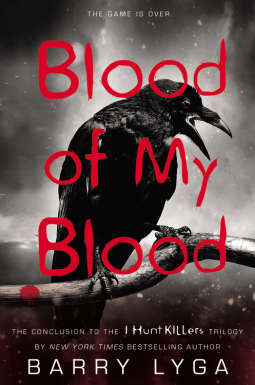 This series is best read with no spoilers, so I will just recommend that you read the other two novels, then rush out for Blood of My Blood (it's not a standalone book). Lucky us, the wait is over. 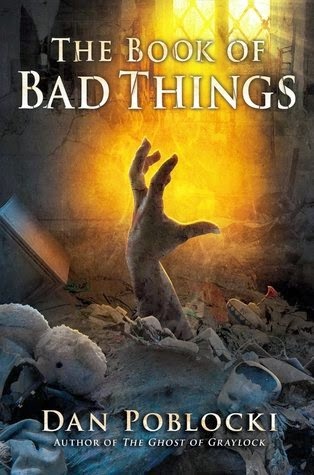 Hooray to Dan Poblocki for writing a novel with a title that would hook me instantly: The Book of Bad Things. There are so many ways that a book with this title could go, and actually, it was different from any of my guesses. Cassidy Bean lives in Brooklyn but spends her summers with a host family out in the country. This summer is different, though, and it all seems to be stemming from the death of a hermit who stayed in her house, hoarding items. Anyone who took the hermit's belongings was visited by her ghost. If they didn't return what they took, terrible things would happen. Cassidy and her friends are the only ones who can make things right, if Cassidy is willing to face all her fears in The Book of Bad Things. As always, I have to applaud Poblocki for writing genuinely scary books for middle grade/middle school readers. He doesn't dumb anything down for them. There are really ghosts and zombies in this book, mixed with some other common fears like intruders and panic attacks. In spite of the fantastic nature of his books, there are real world problems, as well. For example, Cassidy's mother is pretty terrible, disinterested in her daughter and involved with sketchy men. This isn't resolved at all, it's just something that Cassidy has to deal with as she looks forward to her summers with the Tremonts. If I could make one change, I would have made the book a bit shorter. 256 pages isn't very long, but it can be daunting for some of the developing readers who would love to read something with a cover this enticing. For these kids, there is a huge difference between 200 and 256 pages. It's a minor quibble with a terrific and frightening novel. Thanks for NetGalley for providing this book in exchange for an honest review. Cutting really scares me. It's something I don't understand, as someone who hates pain. I can't imagine getting a rush and relief from bleeding. Still, it is increasingly common among adolescents, and Kiss of Broken Glass made it seem like everyone is cutting themselves. This could be a trigger for some readers, since one of the points that author Madeleine Kuderick makes is that some girls cut just to fit in. After Kenna is caught cutting herself in the school bathroom, she is institutionalized for 72 hours under Florida's Baker Act. This novel in verse follows her through her time under supervision. I love novels in verse, but felt that the choice to write in this style limited my access to the characters, especially when the book is only 224 pages. None were very fleshed out, so I could not sympathize very much with Kenna's situation. While it may be realistic, it was frustrating that Kenna's friends turned on her once she was hospitalized, but Kenna doesn't explore where she will continue to be friends with them when she is realized. 72 hours is not a long time, so her problems wouldn't be solved, but I would have liked more consideration given to Kenna's re-entry to school and her normal life. Overall, not a very impressive debut, but it was fun to read a novel in verse again. I'll be seeking out more; I hope they will affect me more than Kiss of Broken Glass.